OPTEC's 3-in-1 Stealth LSO LP system comes with rigid panels that can be customized for all stages of your patient's therapy. 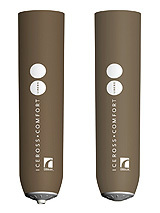 The revolutionary, streamlined design glides to provide smooth compression, comfort, and increased patient compliance. Our unique polymer closure straps allow your patient to achieve precise compression and increased spinal support each time the Stealth is donned. PDAC recently determined that L-0637 is the appropriate HCPCS code for the Stealth LSO LP. Order the Stealth LSO LP now through May 31, 2010, and receive 15% off the regular price. Lighter and stronger are the catchwords that describe the new Seattle Select and Natural Knees available at SPS. The improved Select Knee (SSK600A) is 36 grams lighter and now has an increased weight rating of up to 220 lb. for K3/K4 patients. Overall height has been reduced by ½ in. and incorporates a built-in proximal pyramid. 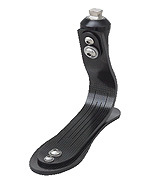 The refined Natural Knee (SSK602A) has reduced its height by 1.5 in. and weight by 24g. Appropriate for K1/K2 users, the knee now has increased flexion angles of up to 165º. 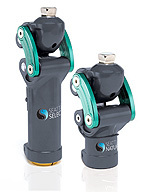 KD models of the Select Knee (SSK601A) and Natural Knee (SSK604A) are available with an anterior/posterior slide knee disarticulation adapter. The Pentagon™ is a posterior fitting, single-upright, five-function knee orthoses that provides the orthopedic/rehabilitation team with a patient-friendly alternative to the traditional bulky double-upright hinged-knee configuration. It is the only system that allows the calf and thigh segments to dynamically shorten and lengthen with the patient's extremity during flexion and extension of the knee. Compensation for this shortening and lengthening is through the use of a free-motion cam that is incorporated into the thigh and calf cuffs. It is available in adult #1150 and pediatric #1050 sizes. The S.T.O.P. orthosis is an extremely versatile spinal immobilization device fabricated in multiple configurations. SADMERC classified. Bi-valve with molded tongues for maximum adjustability. Anatomically contoured to facilitate superior fit on a wide range of patients. Removable, washable lining for increased comfort and compliance. Available rigid molded side panel to increase lateral stability. Titanium pyramids are now standard with Dycor's new K2 DR2 (unassisted transfer/assisted ADL) and K3 DR3 (unassisted ADL) feet. The K2 version is 30 percent more flexible than the K3. Dycor's DR feet are light-­weight and resilient because they rely on deflection of the varying-thickness leaf springs imbedded in the upper keel member, rather than compression of rubber bumpers. The DR feet are ground compliant because they incorporate uni, bi-, or tri-axial ankle articulation with low- or medium-profile options. Weight, including titanium pyramid and foot shell, is 312g (11 oz.). The sleek, new and improved Total Knee 1900 and 2000 models offer increased durability, improved aesthetics, and easier cosmetic finishing. Ossur's Total Knee 2000 is designed for moderately active users who ambulate at varied speeds. The 3-phase hydraulic swing control accommodates changes in walking speed and is suitable for walking on level or uneven ground. The Total Knee 1900 is designed for people with less active lifestyles who are engaged in lower-impact activities and for those walking at a constant speed. Both are polycentric knees with a geometric locking system and a 220 lb. weight limit. Both provide adjustable stance flexion and an adjustable extension promoter. 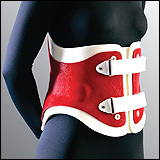 For nearly 15 years, OPTEC has been a leader in custom spinal orthotic manufacturing. OPTEC provides the high-quality products and services you need from your central fabricator. With around-the-clock technical support, quality products at a fair price, and availability to take orders anytime, you will find that OPTEC fits your needs. Further, you will get your custom brace when your patient needs it and just the way you want it. Try OPTEC for your next custom orthosis! 50° ankle range of motion gives the Motionfoot™ a great comfort advantage and superior stability on flat, sloping, or uneven ground. The hydraulic ankle allows adjustment of the resistance by the wearer in both plantarflexion and dorsi­flexion. The prosthetist can also adjust heel height and toe stiffness. Visit booths #A02 and A05 in Halle 1 in Leipzig. Incredibly, and for the first time ever, SPS is offering an additional 15% discount on all Iceross® Comfort™ locking and cushion liners. This limited-time offer is available exclusively through SPS and is applicable on SPS purchase orders dated March 1-May 31, 2010, for any size or configuration. Comfort's Cushioning SenSil Gel Silicone provides protection to bony prominences and scarred sensitive areas. Comfort's Stabilizing Matrix and size-specific distal attachment makes it a good choice for low-activity users with fragile and exposed tissue. 14 sizes in either 3mm or 6mm profiles. 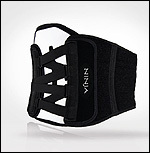 The NINJA belt is the foundation of each brace (L-0627, L-0631, and L-0637) in the NINJA Progressive Spinal System. It has a soft mesh inside and an aggressive loop outside. The one-pull strap is so easy to tighten and fasten. The NINJA Mid LSO is pictured. HOPE Orthopedic: "WHEN YOU NEED IT RIGHT FAST." Allard USA introduces COMBO, a thigh-cuff/knee-brace attachment for ToeOFF or BlueRocker that offers a lightweight, low-profile, functional orthotic solution for the management of genu recurvatum or chronic knee instability accompanied by foot drop. Combine COMBO with ToeOFF or BlueRocker to fabricate a KAFO customized to meet your patient's needs. Uprights with dual-axis joints are easily shaped and adjusted to optimum height for the patient. Adjustable knee-control popliteal interface offers genu recurvatum control. Modular components allow you to accommodate variances in thigh and calf circumferences. Sometimes one is better than two. That's decidedly the case with the new Single Side Dynamic Orthosis available now at SPS. This new AFO from Fillauer is fabricated of high-strength, lightweight moldable carbon fiber. The open-heel construction provides optimal fit and easy entry. Users receive dorsi-assist with subtalar inversion and eversion control. The high-activity design provides freedom of motion during moderate running, walking, and climbing stairs. PEEK rods are available on medial or lateral sides. Reformable thermoplastic Comfil® carbon-composite cuffs add to patient comfort. Fits easily into normal or narrow shoes. SPS is offering an additional 10% limited-time promotional discount on Orthomerica's® CALIFORNIA™ line of prefabricated spinal orthoses. This limited-time offer is extended to SPS purchase orders through June 30, 2010, and is available exclusively through SPS. 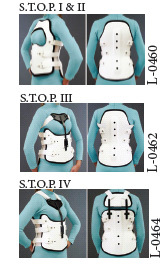 Includes ECO, Soft Spinal System, Mid-Profile, Chairback, Compression, Compressor, Compressor Combo C3, CPO, LOMBAR™, Low Profile, CEO™ Cruciform, Corset Brace, COSMIC™, Kydex® Chairback, and Knight Taylor brace, as well as LIDO2® Cervical System. Specifically excludes AirBack® Spinal System, MRI Extended Cervical Orthosis, Supra-Lite™ Cervical Orthosis, TORSO Lite™ Spinal System, and TORSO™ Spinal System. 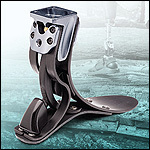 The Ibex Foot System is a leap forward in multiaxial foot design. The innovative micro-slices in the Ibex pylon and the split heel plate provide controlled inversion/eversion for terrain conformance. The multiaxial design is energy optimized with a long carbon pylon and full-length heel plate that allows the Ibex to reach foot flat sooner and store more energy. The unique components of the Ibex work together from heel strike to toe-off to provide stability without sacrificing energy return. The Ibex foot's balanced performance gives amputees the confidence they need to meet life's challenges head on. The Soleus® offers a dynamic heel that allows for smooth, seamless transition between heel strike and toe-off. Involving the entire foot in absorbing and returning energy, the Soleus' four-spring system accommodates a moderate to the most active lifestyle. The multi-composite design and wide platform heel affords stability, durability, and comfort on various terrains. Synchronized control throughout the stance phase. Weight limit up to 275 lb. (125kg); 3-year warranty. 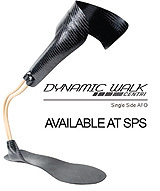 SPS is pleased to launch the new second-generation Plié 2.0 MPC Knee. The redesigned microprocessor knee provides a seamless blend of performance and safety. Its synergistic microprocessor and hydraulic technologies deliver a highly responsive prosthetic knee while facilitating a natural and intuitive mobility. Microprocessor control of both swing and stance phases delivers advanced stumble-recover capability. The finely tuned control system delivers near instantaneous adaptation to gait dynamics. Freedom Innovations' game-changing Plié Set-Up Wizard eases performance optimization and increases fitting efficiency. The new Wizard streamlines programming and set-up of the knee, utilizing automated parameter settings to maximize performance. The GXL-Knee (GX-Locking Knee) incorporates the best of both worlds from our Key Lock™ (1015) and GX-Knee (9000) knee joints. Integrating the extension-assist feature of the GX-Knee with the locking mechanism of the Key Lock gives you and your patient a whole new level of confidence and convenience. Model 9015 is a free-motion knee joint that is designed to provide extension assist, not prevent knee flexion. In addition, the GXL-Knee has the option of locking at full extension for use as a locked knee joint. Ultraflex toe pads are available for purchase individually or with Ultraflex customfabricated orthoses made in the Ultraflex Lab. Ultraflex toe pads are an ideal addition for neurologically involved patients. They come in extra small ( ∆ ≾ 2 3/8 in. ), small(2 3/8 in. ≾∆ ≾ 2 5/8 in. ), medium (2 5/8 in.≾ ∆ ≾ 2 15/16 in. ), and large (2 15/16 in.≾∆ ≾ 3 1/8 in.). Ultraflex toe pads are recom-mended for use with Ultraflex Adjustable Dynamic Response™ UltraSafeGait™ for managing gait deviations. Ohio Willow Wood's LimbLogic® VS provides amputees secure and reliable suspension. The system is easy to fabricate, program for patient use, and monitor performance. It is the only fully-integrated electronic vacuum suspension system available. A remote control for adjusting and monitoring vacuum levels comes with every system. It is the only waterproof electronic vacuum suspension system. The system may be used in laminated as well as thermoplastic sockets. Friddle's offers chafes and loops in a variety of shapes and sizes. We offer the chafes by themselves, with a stainless steel oval or rectangle loop or with a polycarbonate loop. We also offer loops only. Our chafes are available in 1 in., 1.5 in. and 2 in. triangle sizes, and in a 2 in. rectangle size. Our chafes and loops are now sold in packages of 25. The Ultraflex Universal Joint uses a tried-and-true clevis design for maximum M-L strength, yet is extremely lightweight and low profile. The Ultraflex Universal Joint is comparatively smaller, lighter, and stronger. It can be used on ankles, elbows, or wrists, as well as for both adult and pediatric applications.Recommended as a companion joint to Ultraflex ADR™. Molding dummy included. Dimensions: Length: 17/16 in., width: 7/16 in., height: 19/64 in., weight: 0.5 oz. Liberating Technologies Inc. announces an upgrade to the Boston Digital Arm, featuring a high-capacity, dual-voltage, lithium-polymer battery and new molded forearm. It is compatible with all manufacturers' terminal devices, including bebionic and i-LIMB Hand can control up to five devices simultaneously. This prosthesis can be operated with various input sensors including myoelectrodes, Touch Pads, positional-servo transducers, and switches, allowing the prosthetist to tailor the system to accommodate the patient's specific needs. The Boston TMR Arm is also suitable for patients who have had targeted muscle reinnervation surgery. Orthomerica Products Inc. introduces the California® ECO™ (Extension Compression Orthosis) developed to comfortably extend the thoracic spine and unweight the wedged vertebral body in order to promote healing and pain relief. The ECO stabilizes the pelvis and lumbar spine to ease pain. Effective for individuals with osteoporosis, vertebral compression fractures, thoracic strains, and debilitating kyphosis. The ECO is as simple to apply as a backpack or jacket, with easy-to-reach, self-adjusting, padded shoulder straps. The metal spinal frame can be easily contoured to the patient's thoracic and lumbar spine. The new Electric Lock Actuator for the LTI Locking Shoulder Joint by Liberating Technologies Inc. enables amputees who cannot operate a mechanical release to use this shoulder joint. The new actuator is operated by a rocker switch and can have its own lithium battery. The Locking Shoulder Joint (SJ90) is also available in a manual-lock version with 36 locking positions and friction-adjustable abduction. At only 60mm and 172g, it is suitable for most adults and teens. Available in endoskeletal and exoskeletal versions. Available only through licensed practitioners. Made with X-Static® Silver fiber for proven antimicrobial protection and unique therapeutic properties, the X-Silver AK and BK Shrinkers™ offer a comfortable environment for short- and long-term use. 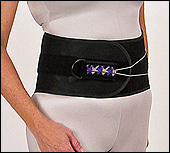 The AK EasyWear™ Belt eliminates tightness around your middle. One belt size accommodates a 32-50 in. waist. Real easy: BK Shrinkers are made with a gel locking system to prevent migrating. Easy to order: Available in five widths and three lengths. Interchangeable right/left-side applications. Easy to care for: Machine wash and dry. CAD/CAM developer Delcam has established a dedicated custom orthotic website. Easier navigation to solutions that are important to you. Whether you are a patient, a practitioner, or a lab, you will find information on how you can step into the Delcam digital clinic. 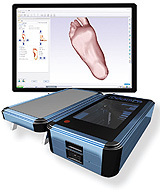 Access to information on all of the powerful yet easy-to-use solutions from Delcam for orthotics, OrthoModel, OrthoMill, OrthoManager, and the new iQube scanner. Immediate access to request a demo in your area. Ability to search news, case studies, videos, and events.